Lost in Translation: Orientalism, Cinema, and the Enigmatic Signifier develops an analytical framework for attending to a broad range of visual texts, from cinema to art installations. Homay King is equally expansive in terms of the historical periods and genres from which she draws her texts, with the book examining films such as Chinatown (USA 1974), Blade Runner (USA/Hong Kong 1982) and The Lady from Shanghai (USA 1947), through to Antonioni’s Chung Kuo: Cina (Italy 1972), Wim Wenders’ Notes on Cities and Clothes (West Germany/France 1989) and Sophie Calle’s installation, Exquisite Pain (2003). As the first clause in the title suggests, the key premise that underpins this selection of films and artworks is the problem of interpreting different imagined and represented relations between East and West. This is encapsulated in King’s attunement to the “continued and endless processes of translation and detranslation of the psychical enigmas of alterity […]” (pp. 17-18). The representation of otherness and the problem of knowability and unknowability are central concerns here. As King notes, the task for scholars is not to seek out “good,” authentic images of those marked as “ethnic others” in Anglophone and European cinemas. Such a task will always risk reinscribing the paradigms that produce stereotypes while ignoring the nuanced and often paradoxical work of cinema, especially popular cinema. To this end, King takes another analytical path, moving away from the well-trodden ground in Asian American studies of critiquing stereotypes to explore other embedded aspects of representation. Principally, King explores Asian racial representation through the terms of style, objects, and mise-en-scène. Another of her key aims is to seek out forms of representation that might “deconstruct the long-standing binary opposition between monolithic notions of East and West” (p. 10). In this respect, the greatest strength of King’s project is the move beyond the representation of characters and historical figurations such as the Yellow Peril that have been thoroughly analyzed by scholars such as Gina Marchetti and Peter X. Feng. This book enters the new terrain of intersubectivity and translation, confronting the how and why messages about the East are rendered indecipherable given their narrative and aesthetic production. 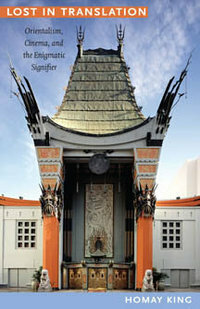 In one chapter, King explores how the “orient” appears as enigma in Classical Hollywood cinema. In one example she looks at the function of Asian objects (ornaments, silken Chinese wall hangings, centerless coins) that contribute to an orientalist mise-en-scène in The Big Sleep (USA 1946). These objects signify the presence of further secrets rather than resolutions in the narrative. They mirror the enigmatic narrative of the film noir, the limit of rational thought. Another chapter features the example of Antonioni’s 1972 documentary about China, Chung Kuo: Cina. Here King examines how the film sidesteps the proposition that the film might uncover an authentic essence of China. The film achieves this by laying clear the images of national identity that the Chinese authorities allowed him to record as performance and is, thus, “predicated on an aesthetic of surfaces rather than on the penetration and exposure of deep-lying secrets” (p. 111). There is also a series of reflections here—the filmmaker outsider constructing an image of his cultural other that is in turn fashioned for an external other in the West. The enigmatic nature of these signifiers provides the binding notion for the book. Jean Laplanche’s “enigmatic signifier” describes the messages received in infancy from others that cannot be easily decoded by the child—they produce “remainders,” pieces of information that are lost in translation. The actual collection of signifiers is specific to each individual and maintains significance for each subject in their unconscious throughout life. They are “source objects for the drive” (p. 20). King extrapolates this out and identifies enigmatic signifiers of race and culture that function quite differently in each chapter, with each grouping of films or artwork. Yet, the concept of an enigmatic signifier provides the analysis with an important point of departure, and a rationale for the selection of films, rather than a (psychoanalytic) methodology per se. While King explores the manner of the enigma and its signification in regard to each film, the work of the text and the process of translation that occurs within the world of the story or the film, drives the analysis rather than the application of psychoanalytic theory. I believe this is not a problem for the analysis of the film (indeed, it produces a more compelling and relevant film studies approach), however, it does present a point of confusion around the framing of the project. Moreover, the use of the term “orientalism” in the title, and a brief discussion of Edward Said’s 1978 book of the same name in the introduction is also misleading, posing a frame for the film analysis that is somewhat redundant. Said’s thesis that the West has maintained a systematic discourse about the Arab world (the Orient) and thereby, managed, and even produced a Western definition of the East was extremely influential for at least two decades. Fewer scholarly approaches to reading representations across cultures present themselves now in relation to Said’s work than was the case even ten years ago. King, while briefly citing Said, does not, in any significant way, define her argument explicitly in the context of orientalism. Lost in Translation is a book about the problem of presenting the East in Western cinema contexts, but it does not seek to take up Said’s metatheory as an explanatory framework. For these reasons it is unclear why orientalism features in the title. At times the discussion seems to pull back from more rigorous and in-depth theorizations, whether that be in regard to semiotics, psychoanalysis or discourse analysis. For this reader the lack of a conclusion was also a disappointment, especially as a number of chapter conclusions did not draw together, for the reader, the overriding import of the analysis around each grouping of films. Nevertheless, the book is an interesting read. Moreover, it makes a vibrant contribution to the important area of film studies that attends to ways of reading the other within diverse cultural and cinematic frameworks and this is to be welcomed.